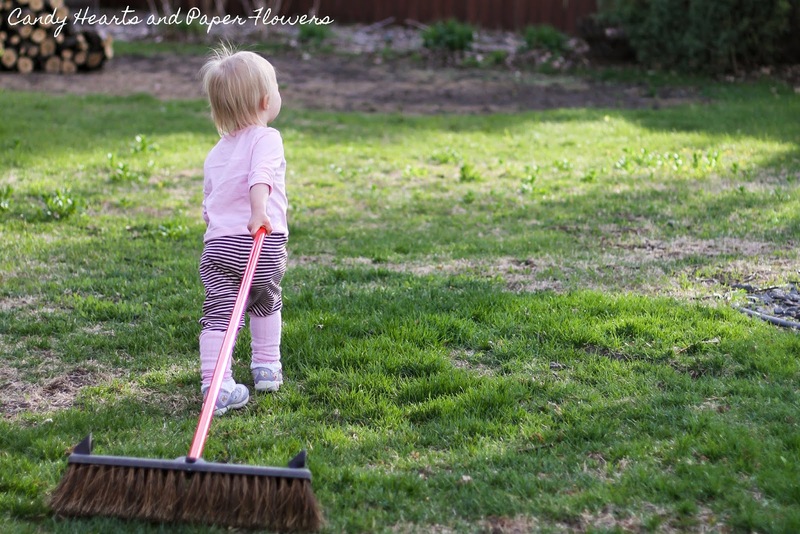 I wrote a series on establishing Routines with Kids a couple of years ago based on my experiences with my nieces and nephews, but now that I have my own little girl I thought I'd share how we're handling chores. My daughter just turned 2 and she has chores. She doesn't know they are chores, she thinks she is helping mommy or daddy. Which she is, sort of. Yes, right now I could get these chores done a lot faster just doing them myself, but then what does that teach her? So, while it maybe doesn't really help me to have her bring in the mail or water the plants, it will in the long run. Everything she does for herself and for me now that earns her praise and increases her self-confidence, means that much more she'll be able to do for herself in the long run. So, I think of my added time now as an investment in her confidence and self-sufficiency. Granted a lot of these are still "supervised" chores, meaning she doesn't just go and do them, but she will if asked and sometimes verbally guided. I'm very big on self-sufficiency, and will ask her to do things and she knows if she needs assistance she just has to ask "help please" and I'm there to help. When she was old enough to walk reliably, she would put her pajamas in the hamper. Now she helps me by putting clothes in the hamper and also sending them to the laundry room. Granted it's only putting 3-4 articles of clothing in a hamper, but we have to start somewhere. Each type of toy has it's own basket, she knows where they all belong and will put her toys in the appropriate basket. I don't care if she just tosses everything in the basket, so long as it's in there. When she's older we can worry about being tidy, for now she's learning to pick up. 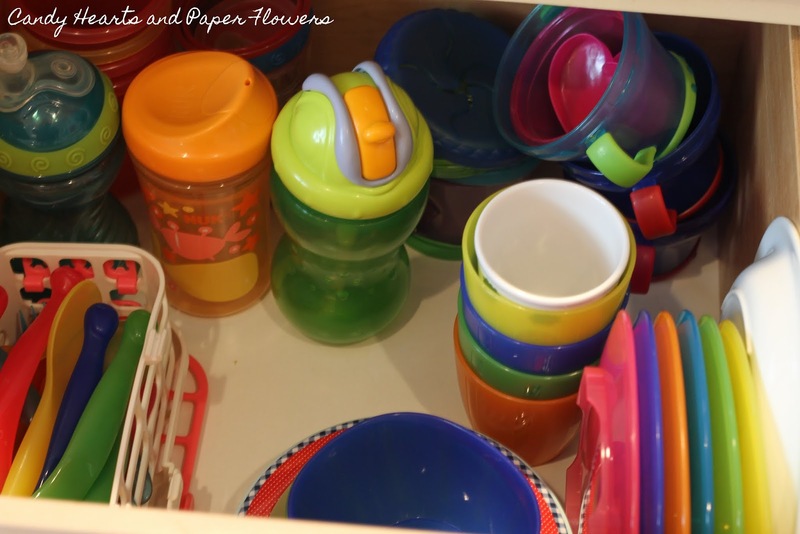 She has a rolling drawer tower for coloring books, play doh, finger paint, etc. She puts her art stuff back in the tower when she's done with it. We just have to work on asking before pulling it out. This isn't consistent, because if it's something hot I'll fill her plate and stick it in the fridge to cool a bit before bringing it to her. However, if I ask her to get a bowl, she will. I store her cups, dishes and utensils in a drawer in a lower kitchen cupboard so she can reach everything. I brush her teeth first, then she brushes. She washes her own hands after dinner and will tell you "hands please" when she is ready to wash them. We are slowly working towards more self-sufficiency in this area. Every day when she gets home she goes to the mailbox with either myself or my hubby and she brings the mail into the house. I think this is her favorite chore and it was self-imposed. She made it her job to bring in the mail, which is great! Both indoor plants and soon the outdoor planters. I got her a mini-spade and watering can to help me. She does other things beyond this, but this is the list of things that are currently "her chores". 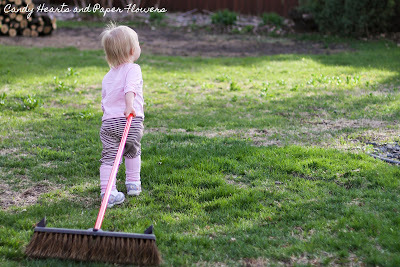 She "sweeps" the back patio, wipes the dinner table, helps in the kitchen, picks up "ickies" and puts them in the trash... Icky can be lots of things according to her definition, so I have to peek in the trash once in a while to make sure something important wasn't deemed icky by her, like dog toys. 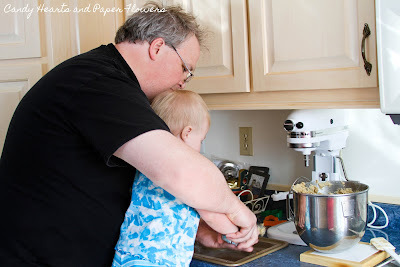 Toddlers love to help, they very much want to be just like mommy and daddy at this age. I'm taking advantage of it to establish lifelong good habits as much as possible. Granted I have to sweep after her and wipe the table after her for the time being, but I have her "help" me so she doesn't realize I'm redoing what she's done. I always praise her afterwards for a great job and being a good helper, and she LOVES being a good helper. Plus, as a parent it's fun to see how proud she is of herself after she's helped. What chores do your toddlers do? Or if your children are grown, what did they do as toddlers for chores?